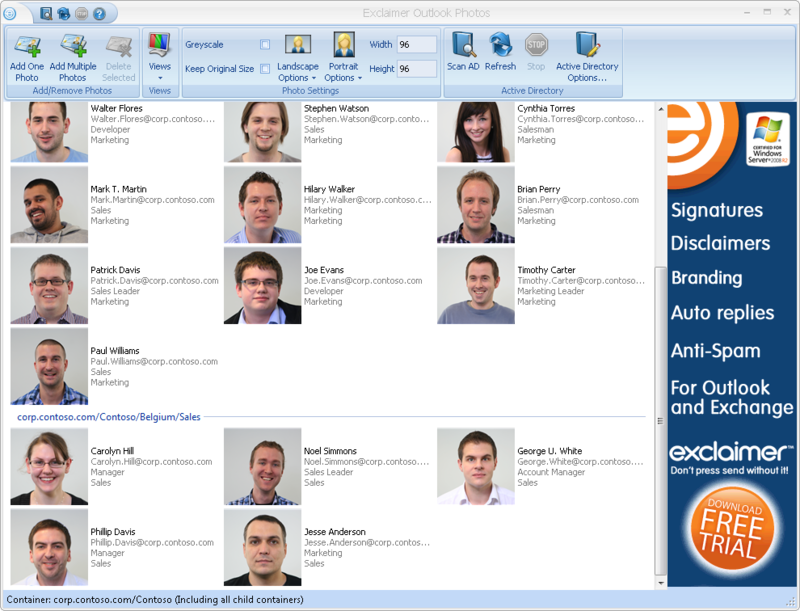 Put photo IDs on every Outlook 2010 email, SharePoint profile and Microsoft Lync conversation with anyone on your Exchange 2010 server - turn departments into teams and colleagues into friends. Batch-import multiple photos at once: select the folder or drive with your photos and migrate them all to your Active Directory in a single click. File names can be automatically matched to user profiles based on any AD field - name, employee ID and more. ...... jpg' could be added automatically to Karen Green's profile. It auto-crops images to fit the 'People Pane' in Outlook, so all your photos fit the format, without any effort from you - it's team-building without being back-breaking. Get photos in the Outlook Social Connector (OSC), SharePoint and Microsoft Lync - for free. Putting everyone's photos in your Global Address List (GAL) only takes a few clicks with Outlook Photos. Change the nature of email - We've been using Outlook Photos here at Exclaimer for a few months and we're amazed at just how much it changes your use of internal email. Scanning photos of people is so much more natural than reading their names - you'll know exactly who's on the email, Lync IM or SharePoint directory in seconds. Catch new spam e-mails and clean any Outlook folder from spam. Qweas is providing links to Outlook Photos 2.0.50123.3 as a courtesy, and makes no representations regarding Outlook Photos or any other applications or any information related thereto. Any questions, complaints or claims regarding this application Outlook Photos 2.0.50123.3 must be directed to the appropriate software vendor. You may click the publisher link of Outlook Photos on the top of this page to get more details about the vendor.